The Wright Wreport: 'When I Come to Die' Will I Meet my Maker? 'When I Come to Die' Will I Meet my Maker? Chris Chalk as a man awaiting his executioner, not realizing the miracle ahead in “When I Come to Die.” Photos by Erin Baiano. NATHAN Louis Jackson is the author of last year’s moving “Broke-o-logy,” among other works. His new play “When I Come to Die,” has elements of interesting mystery but also some major flaws. 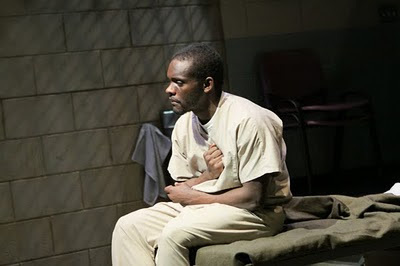 In “When I Come to Die,” Damon Robinson (Chris Chalk), having inexplicably survived a lethal injection, is back in his cell again awaiting death. His next-door neighbor on death row, James “Roach” Teagle (David Patrick Kelly), is preparing his last words while he waits. Convinced that he is alive because someone screwed up at his execution, Damon goes to the prison chaplain, Adrian Crouse (Neal Huff) for an explanation. “In my business," the priest tells him, “we call it something else.” Father Crouse suggests that Damon can use the temporary reprieve to make a difference. 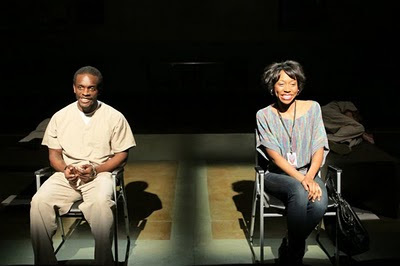 Siblings Damon (Chris Chalk) and Chantal (Amanda Mason Warren) have an extraordinary family reunion in "When I come to Die." Damon begins by making a list of demands, and abandons that in favor of leading his fellow inmates in shouting, a stunt that is interpreted by the guards as a riot. Once he is released from solitary, Damon discloses to Father Crouse that he finds solace in the “contact” he gets from the letters he keeps under his bunk. The connections he sought were never made since the letters are all ones that his father had returned to him unread. He reads these letters meant for his sister and brothers to himself in his cell. CC in an unblinking performance is alternately sympathetic and belligerent. Radiant and inspiring as Damon’s estranged sister, Chantel, is Amanda Mason Warren. She is at once hopeful and hopeless, as she meets her brother for the first time since she was a little girl. 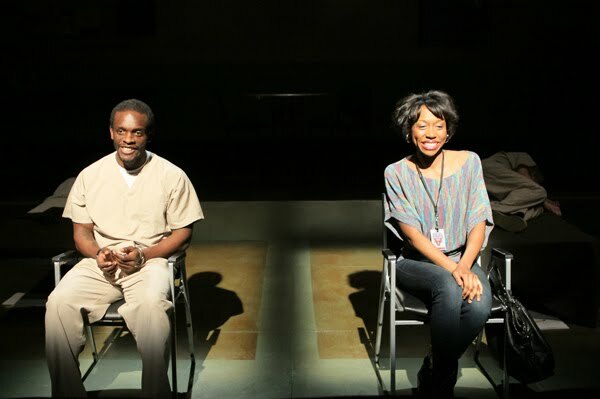 Still, “When I Come to Die” – produced by Lincoln Center Theater’s LCT3 and in a workshop-like setting at the Duke Theatre through 26 Feb. – shows its weakness in its poor character development. It is unfortunate that NLJ’s murderers are not simply not-monsters as Roach says, but that they are nearly lovable. The crimes that they committed are a slow reveal and when exposed tend toward cliché. NLJ is too much of a realist to make the most of the subtexts in “When I Come to Die.” Is Damon’s survival, owing to divine intervention? Can he make use of his second chance? “When I Come to Die” only winks at the possibility of a miracle, and barely hints at redemption.